what an adorable way to usher in autumn! love this. What a beautiful dressy yet casual Fall look, Shauna. 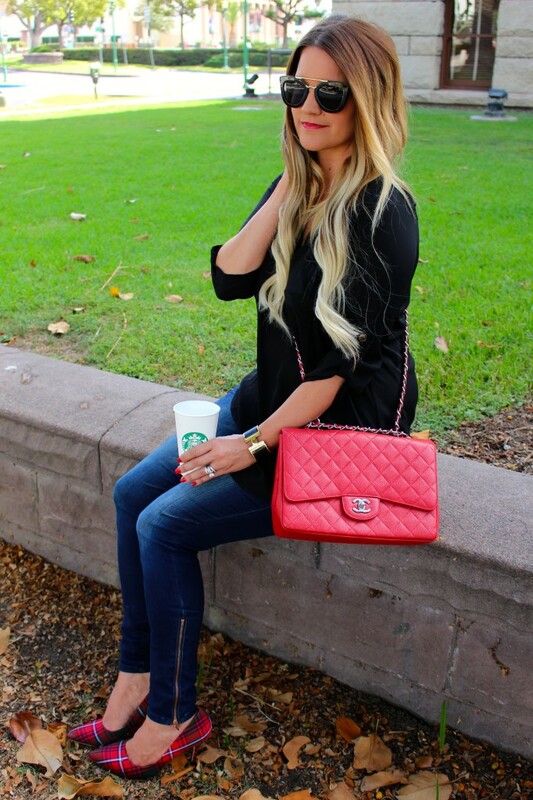 I am head over heels in love with the plaid pumps and quilted red crossbody bag. WOW!! This is so city chic, I love it! Between green and red, I’d choose red, too! Ahh! You are wearing our favorite shirt haha! I wore it in my post today too — I am way too obsessed with it. Love it with the red plaid, so perfect for fall! Hope you had a wonderful weekend! I adore those plaid heels! And this is my kind of fall outfit. Laid back and chic at the same time. This look is so gorgeous and I am in love with those shoes. I don’t wear a lot of plaid but I could definitely go for those. Best & your hair <3! Those shoes! That bag! I cannot handle all of the fabulousness!!!! Love this look! This amazing Chanel combined with those shoes is even more perfect, if possible! These heels are so lovely! They make me think of Christmas coming. What a nice outfit Shauna! i am in love with your heels..love your sunnies too! The shoes, the bag, the hair! Perfect! Instant shoe obsession!! I love these and your red pop with the bag too!!! Just sheer perfection!! I am in love. Those plaid heels are everything, clearly we had the memo about plaid today! Love this outfit. Obsessed with your bag and shoes! The plaid is so fun. A perfect fall look! These heels are to die for!! Love this pop of striking red! Oh, Those shoes!!! Perfect fall accessory. I love that you went with a simple outfit to let them be the standout. lovely outfit, your heels are gorgeous!! Those shoes are amazing!! I love this look and that bag is everything!! I love plaid and plai shoes are fabulous! Love the whole look!!! Seriously, these heels are so much fun! Those are so perfect for fall! I’ve never seen plaid shoes before! I am in love with your pretty plaid heels. They are perfect for fall, you look great. This look is gorgeous! I love your plaid heels and your gorgeous sunglasses! STOP it with those plaid shoes–I think I am in love!!! Those are so fun and perfect for fall and the holidays!! I am loving this outfit! Also, your hair is GORGEOUS! I love the zip on the bottom of your jeans. The red pop of colour is stunning and those shoes are incredible. Oh those darling heels are the epitome of fall! Love! Gorgeous! In love with those plaid heels! Perfect for fall! I love that you went with a simple outfit to let them be the standout. A plaid pump def feels like fall. 🙂 Great look, lady! LOVE this outfit and those plaid shoes! Still so obsessed with those sunnies! What a fun pair of shoes – you are right – those are so cute for fall! Loving the red color! Also – your HAIR looks amazing in these photos! So long & blonde! This is such a cute outfit! I adore those heels! LOVE THIS!! That red purse is so amazing!! Pretty look, Shauna! I’m obsessed with your plaid heels! Going crazy over that BAG!!!!!! Dying over those heels!! (Really the whole look.) Gorgeous and so much fun! To hear that they are comfortable makes me even more excited. Love! The shoes & bag really make this outfit pop! What a pretty fall outfit, love the pops of red especially those amazing plaid heels!! The Chanel and heels put it all together! In love with these heels! They are darling, and are so perfect for now and the holidays! Love it! LOVE the black and red!! And that bag is amazing! Seriously, you are gorgeous. I am so in love with the pops of red! The shoes are amazing! Those heels are perfect love the color kinda reminds of christmas. very nice outfit and love you hair by the way cute change. Your ombre hair looks fantastic! Love this look! Yup those plaid pumps are amazzzinggg!!! So cute!! But of course I expect nothing less because you are always so fabulous! 🙂 … Tanks for linking up!!! So cute!! And they come in green?! That’s dangerous information! Thanks for linking-up for Lovely Little à la Mode.